I knew that title would have everyone for my blog. In droves! No, but really. I wish I were more prepared in the meal department when babies come on the scene but I'm not and I'll never pretend to be. The truth is that we rely on quick and easy and not-so-healthy options in the first days and weeks but with Abe and Bosco we've also leaned heavily on Blue Apron to get us over that first month hump which makes for happier humans all around. The older kids are getting old enough that their not only interested about when meals are going to be served but also how they're made so after we put the little kids down for naps after church this past Sunday we let them help like the kind parents that we are. 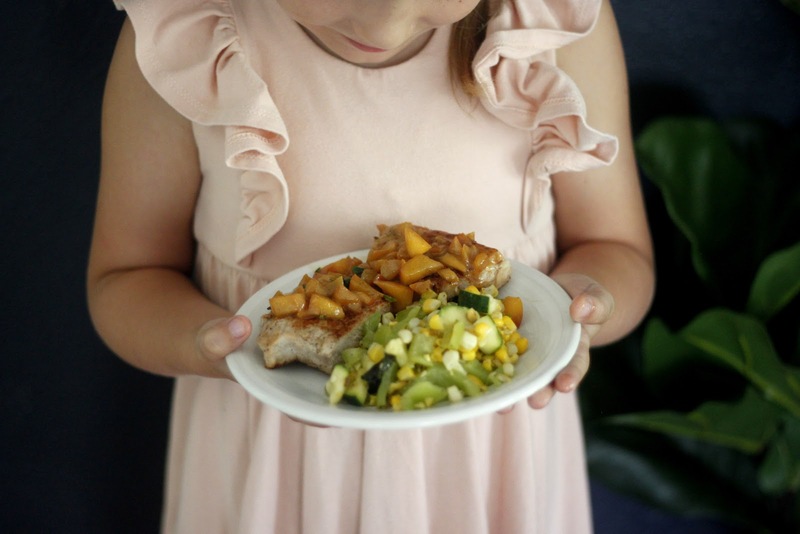 Julia took great care and pride in checking off the steps as we made Pork Chops and Peach Sauce with Corn and Summer Squash Succotash together. Simon said he'd never had a pork chop that tasted good so (as usual) he was skeptic but I was hopeful and optimistic as Blue Apron has yet to let us down. I've heard of people grilling peaches but I'd never thought to sauté them but I'm going to have to add it to my teeny tiny recipe repertoire because the sauce was GOOD. In true oldest fashion, Julia has to help Sebastian do the one task he really wanted to do. ... but no offers to help, shockingly. Checking everything off very diligently. ... keeping the pencil handy. ... look at the butter placement/focus. + They are currently working toward developing a sustainable food system and use very high quality ingredients - you can check out their vision page here! They loved coloring the included coloring page and I won't tell you how many of veggies they had to ask, "sooo what color is that one?" ... changed Simon's mind about pork chops and changed the kids' minds about squash (I'm more excited about the latter)! Want to try for yourself? The first 50 readers to try Blue Apron will get three free meals tacked onto their order just click here!! If you want to browse some of their recipes first click right on over here! I really like to cook and tried Blue Apron a couple of times just for kicks, and I really enjoyed it because the food was great and it actually got my 13-year-old son interested enough to come in the kitchen and help me cook. My only complaint is that I wish they had options for larger families, because 4 servings were not enough for us. I even sent them an email asking if instead of 2 different meals you could select the same meal twice (8 servings), and they responded that they don't allow this--no idea why! not pesky!!! I think it depends on the meal - you might want to freeze the meat/fish. I feel like they say 3-4 days but I've definitely waited longer! Can you edit the delivery day? My Blue Apron comes on Tuesdays. Sorry, off topic... do you have the Nordstrom Gibson Bell Sleeve Poplin top? I love the look , just on the fence as to what the fit will be like. Just wondered if it is as good as the reviews. Thanks!